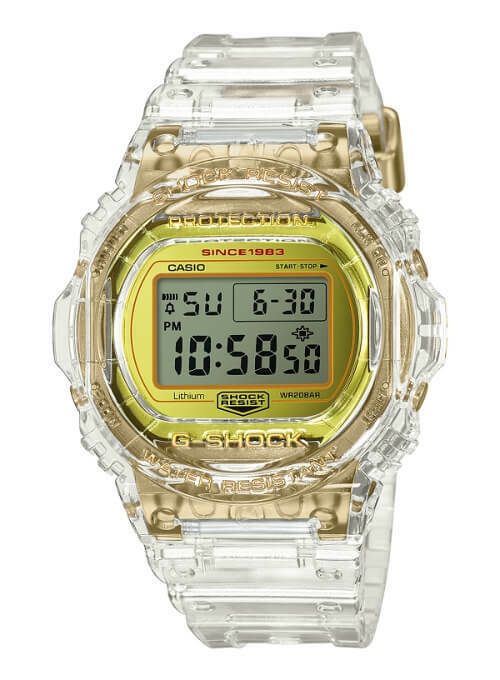 Update: G-Shock Japan announced the 35th Anniversary Glacier Gold Collection for a 14 September 2018 release. 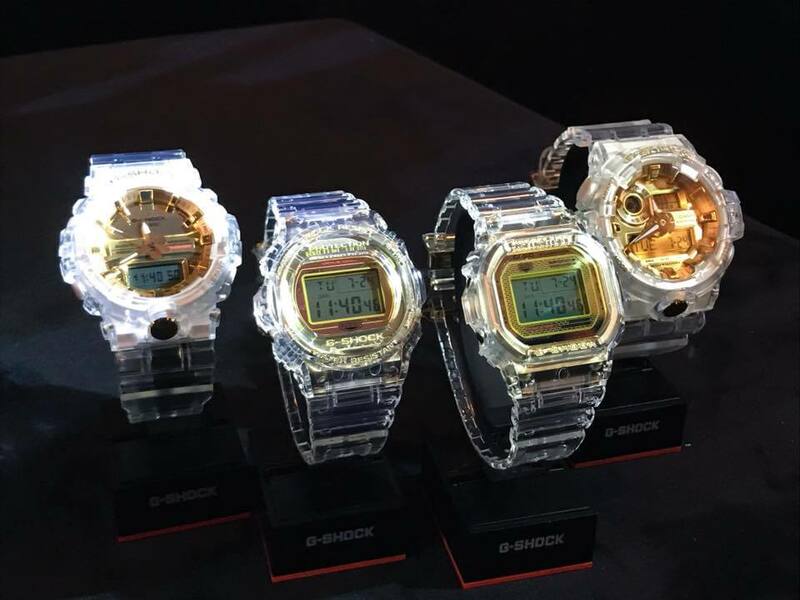 The DW-5035E, DW-5735E, GA-735E, and GA-835E have a list price of ¥22,500 JPY each (plus tax). 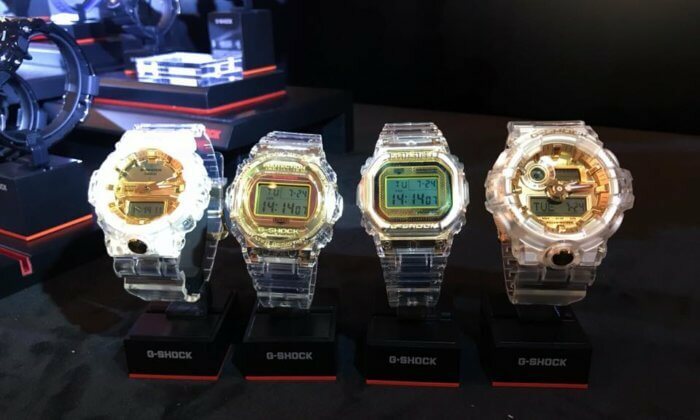 The Japan-market model numbers are DW-5035E-7JR, DW-5735E-7JR, GA-735E-7AJR, and GA-835E-7AJR, and we expect to see a worldwide release as well. It is confirmed that the DW-5035E and DW-5735E have gold ion-plated stainless steel inner cases and screw-lock case backs, and each model has a 35th Anniversary engraved case back. 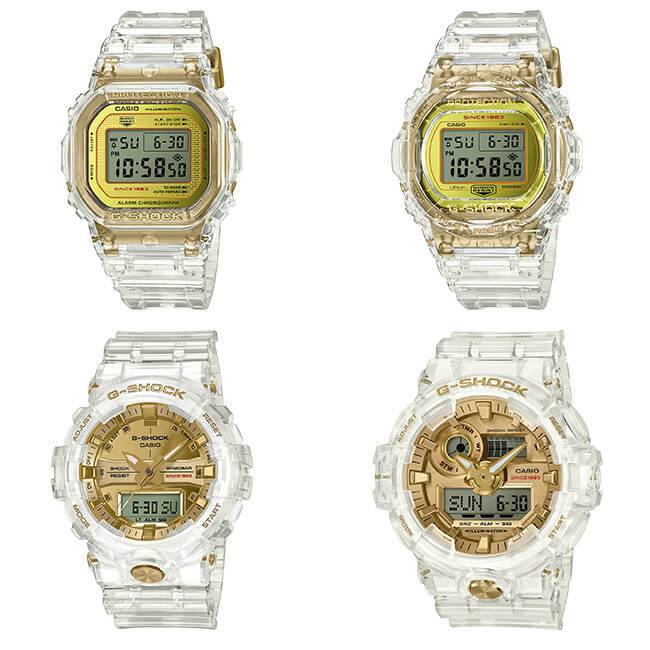 Update 2: Casio America announced the DW5035E-7, DW5735E-7, GA735E-7A and GA835-7A as part of the Skeleton Gold Collection for an October 2018 release. The DW5035E-7 and DW5735E-7 have a list price of $220 USD each. The GA735E-7A and GA835-7A have a list price of $160 USD each. 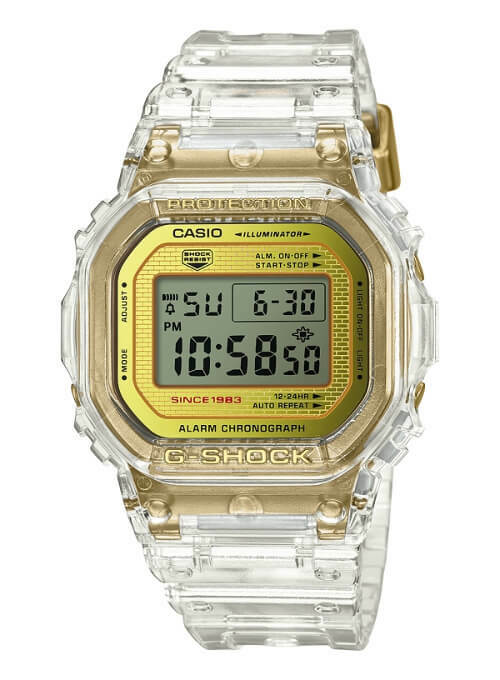 G-Shock DW-5035E-7: The DW-5035E-7 is inspired by the first ever G-Shock DW-5000C from 1983 and like that model has a stainless steel inner case with a screw-lock case back. 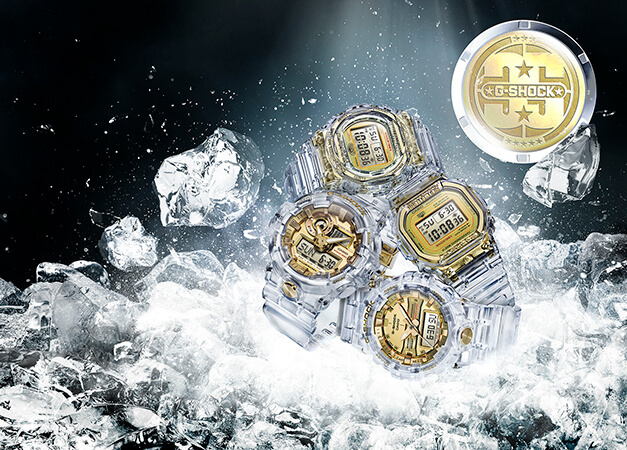 G-Shock DW-5735E-7: The DW-5735E-7 is inspired by the DW-5400 (1985) and its successor the DW-5700, the first non-square, round-face models that paved the way for a huge variety of G-Shock designs. 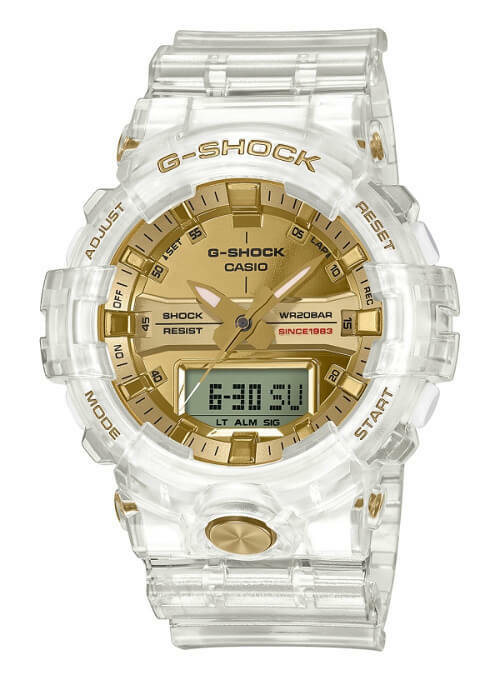 G-Shock GA-735E-7A: The GA-735E-7A is based on the GA-700 released in 2016. This model has a front-facing LED light (Super Illuminator) button and a 5-year battery. This extra-large model is 53.4 mm wide. 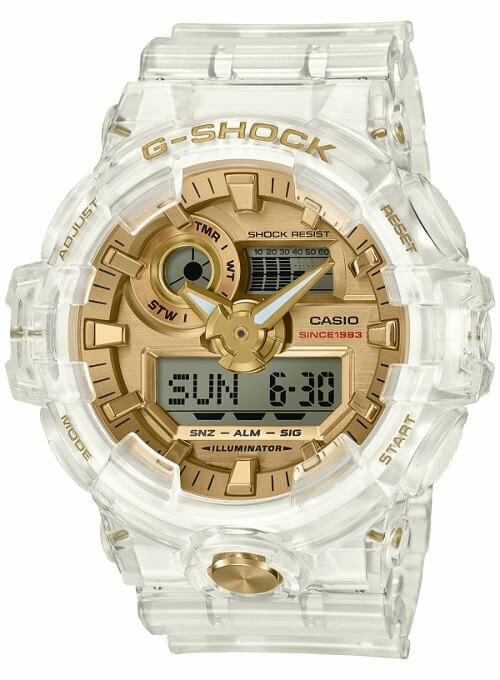 G-Shock GA-835E-7A: The GA-835E-7A is based on the GA-800 released in 2017. This mid-size model features a traditional third analog hand to display the second, a dedicated stopwatch button to start it immediately from timekeeping mode, 120-record lap time memory, and a front-facing LED light (Super Illuminator) button.